Read More It seemed like the moment the most famous Christian rock band in the world Switchfoot released their last album Hello Hurricane, people were already talking on the internet about the follow up, which at the time already had a working title of Vice Verses. The band have come a long way since the early days of their first release The Legend of Chin back in 1997, when the band were only a three piece made up of Jon Foreman, his brother Tim, and drummer Chad Butler. Soon followed New Way To Be Human, Learning To Breathe and then the album that changed everything for the band The Beautiful Letdown. In more recent times the band released what I would count as their most radio/pop friendly record Oh Gravity and then their last release Hello Hurricane. For me there was something not quite right about Hello Hurricane. Yes it had many a great track, but as I said in my review back in 2009 "Will this be counted as the best Switchfoot album? No. Is this the most complete album they have made? No" and I think overall that wasn't far off the mark. In talking about the new album the band makes reference to this. "The making of Hello Hurricane was really difficult for us," says Chad Butler. "We were on a journey where we didn't know what the destination was. This time was much easier, and I attribute that to knowing exactly what the songs were that we were going to work on... That put us in a position of strength this time. The process of recording was more enjoyable and much more focused." For me that does come out in the songs. 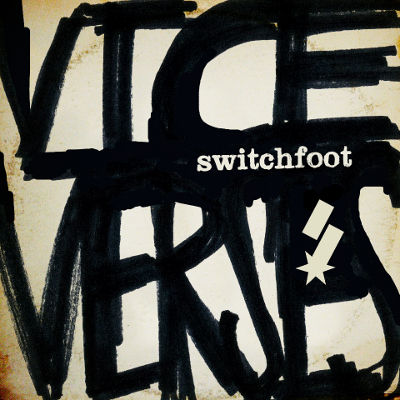 If I was writing a quick overview of what Vice Verses sounds like, I would have to say this rock album is a traditional sounding Switchfoot album, but with many twists and turns along the way. The album kicks into life with Afterlife, which is a dark Foo Fighters sounding rock number. Jon Foreman sings with aggressive intent "I've tasted fire I'm ready to come alive, I can't just shut it up and fake that I'm alright, I'm ready now, I'm not waiting for the afterlife". From the word go you know these lads mean business, there is a hint of self confidence in this song. The band go on to sing "And I wonder why, Would I wait till I die, to come alive? to alive I'm ready now, I'm not waiting for the afterlife" Second track The Original has more of a rock swagger to it, there is a hint of Rolling Stones clashed with Jet's track Are you gonna be my girl. Guitars rocking but with a bit of soul to this one, you can imagine Jagger strutting his stuff around the stage to this track, great tune. Now here is the first twist for me, The War Inside has a hip hop beat backbone, something a bit different for the band. Jon shows the world via this song that he can sing in a very nontraditional rock kind of way. Taking a more rhythmic flow to the lyrics of "Age don't matter like, Race don't matter like, place don't matter like what's inside". Moving on from that style of vocals, next track Restless sees Jon sound more like U2's Bono than I have ever heard before. The U2 comparison doesn't end there, this song could easily have fitted on a few U2 album. This style of sound also comes out in the stunning Souvenirs, softly and gently Jon sings "We were so young, We had no fear, We were so young, We had no idea... That nothing lasts forever..." Before you think Switchfoot have turned into the next U2, don't panic, this really isn't the case just these two tracks have the big stadium anthem rock sound, all ready to fit into the set for those big stadiums gig. For me the biggest twist happens in the middle of the album, Blinding Lights and Selling News continue where the hip hop beats of The War Inside took us. Think Beck and The Beastie Boys mixed with the rock sound of Switchfoot and this might give an indication of what the band are trying to do. Especially the truly pop sound of Selling News is something fresh from the band, and one of my standout tracks. This is band ready to take their fans to the next level, and it's a side of the band I am pleased to have found. But if anybody isn't too sure about the twists and turns of this album, Thrive and Dark Horses take the sound back to the more long established Switchfoot sound. Thrive is a strong big ballad and Dark Horses is rock and roll, amps to eleven, in your face, kind of song with a groovy bass throughout. Musically the band members have excelled themselves, drums, bass, guitar and keys are not happy with just being fine, they have pushed themselves to be the absolute best they can be, and this comes out throughout the album as a whole. One of the most poignant moments of Vice Verses is the title track, with lyrics of "Where is God in the city life, Where is God in the city light, Where is God in the earthquake, Where is God in the genocide... Everything feels rusted over, Tell me that You're there". At times it sounds like Jon's vocals are on the verge of crying in pain at what he is singing, a truly sad and wretched song coming straight from the gut. This is probably the most honest you will ever hear Switchfoot in any setting. What else can I say? Is this the best Switchfoot album ever made? For me, this is the most complete album the band have made. Not scared to talk about how they feel about life and situations. This is a band who are pushing their sound forward, taking their fans defiantly to a rediscovered side of the Switchfoot sound. This is a great come back album from one of the world's best rock bands.